adds flair and flavor to your meal and it is also very healthy. 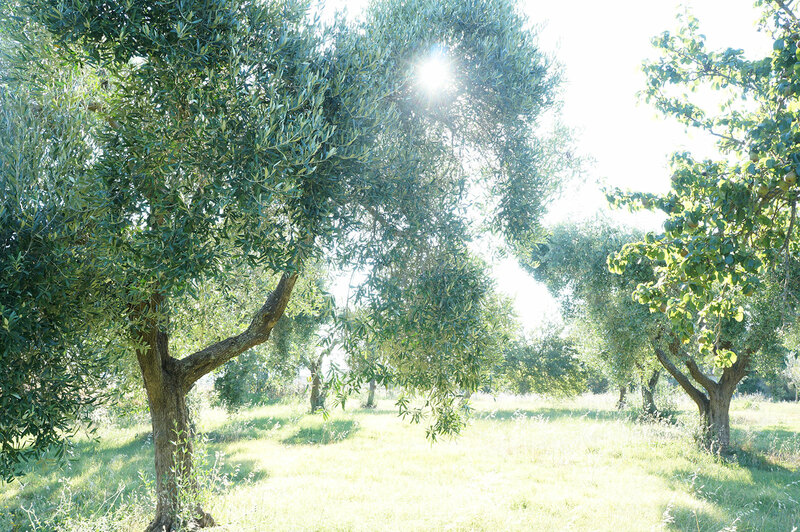 Our Extra Virgin Olive Oil is produced in the Tuscia region, in the heart of central Italy, where the historic Etruscans transfered, from the VII to I century BC, the first long-lived Olive trees that were planted with their many nutrients and beneficial properties. Still today these centuries-old trees of majestic proportions are used for the production of olive oil. 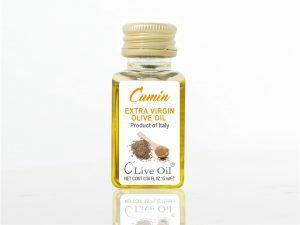 The olives different varieties (Caninese, Leccino, Pendolino, Maurino and Frantoio) are cultivated in Viterbo province, in the historic town of Canino, where the local variety still prevails. The olive cultivars are located a few kilometers from the border with Tuscany and not so far from the Tirreno sea, in an area suited to olive coltivation that gives an olive oil with exceptional many organic properties, the fragrance of fresh fruit and elegant palate with a perfect balance between bitter and spicy aftertaste for the high content of polyphenols and Vitamin E. Final sensations of herbs and artichoke and sweet almond, very low acidity and a lovely emerald-green color. 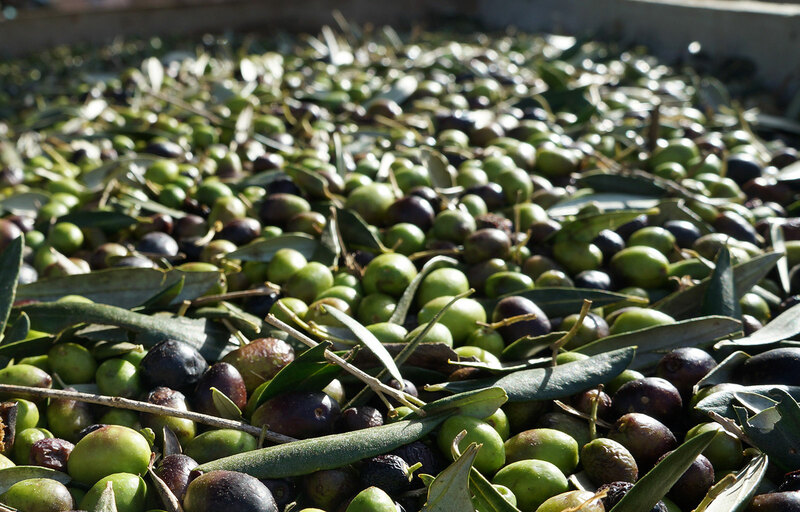 The matured olives are all handpicked in mid-October, earlier than the traditional period, and the delivery of the olives take place within each day of harvest. In the oil mill all the operations of crushing and squeezing occur within 24 hours from the collection. 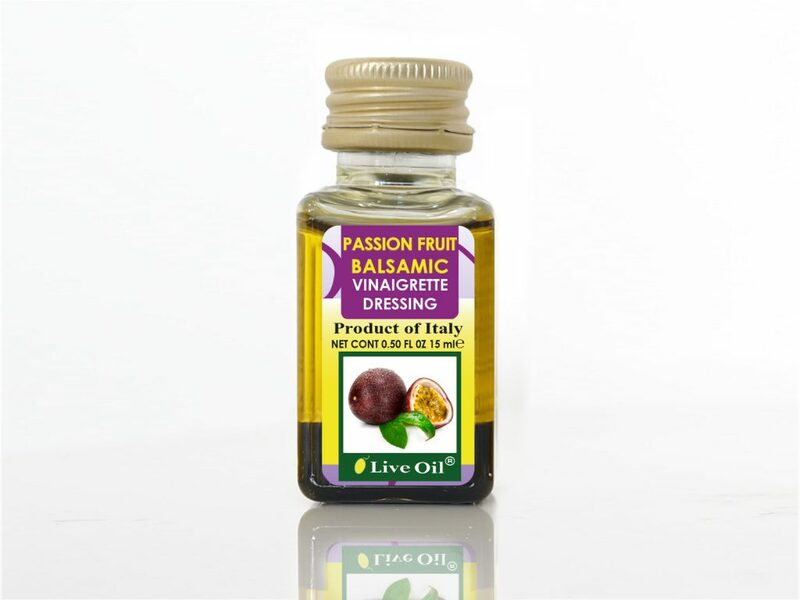 With their passion our growers we have achieved levels of excellence in product quality with awards and honors that have found a big resonance. We pay a lot of attention in the collection, production processes and storage of this exclusive olive oil product. 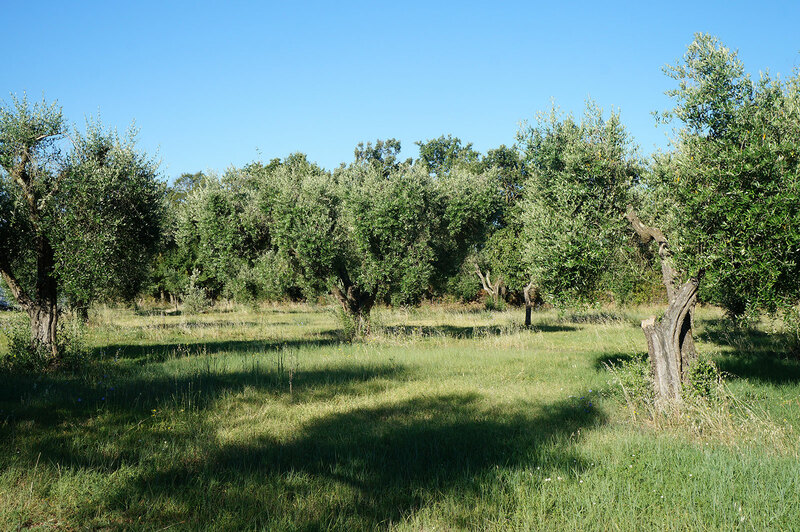 Today, our farmers cultivate in the town of Canino, 3340 hectares of land, over 260,000 olive trees, most of them centuries old. 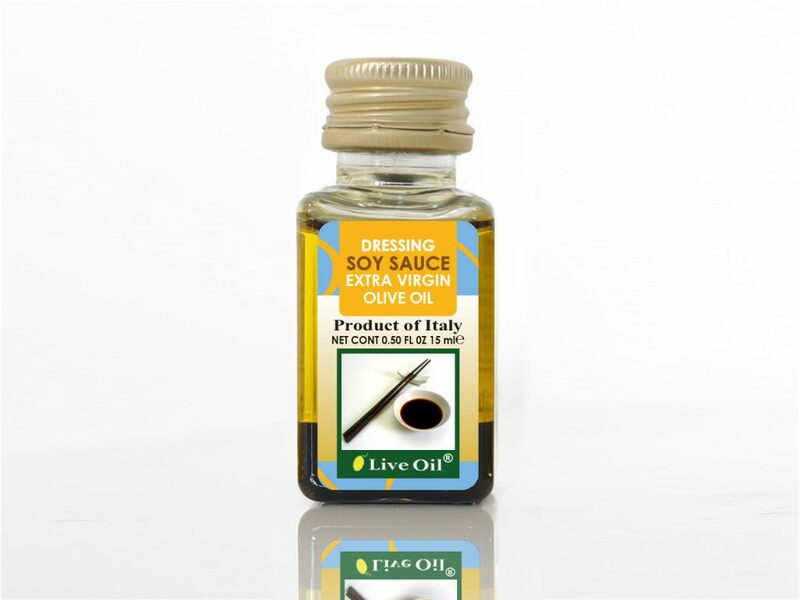 The extra virgin olive oil is mechanically extracted using a modern “Cold Pressing Systems” and transformed in our mill using company owned machinery. 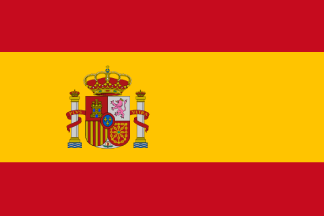 We are proud to say that we produce one of the regions finest genuine Extra Virgin Olive oil of the regions. 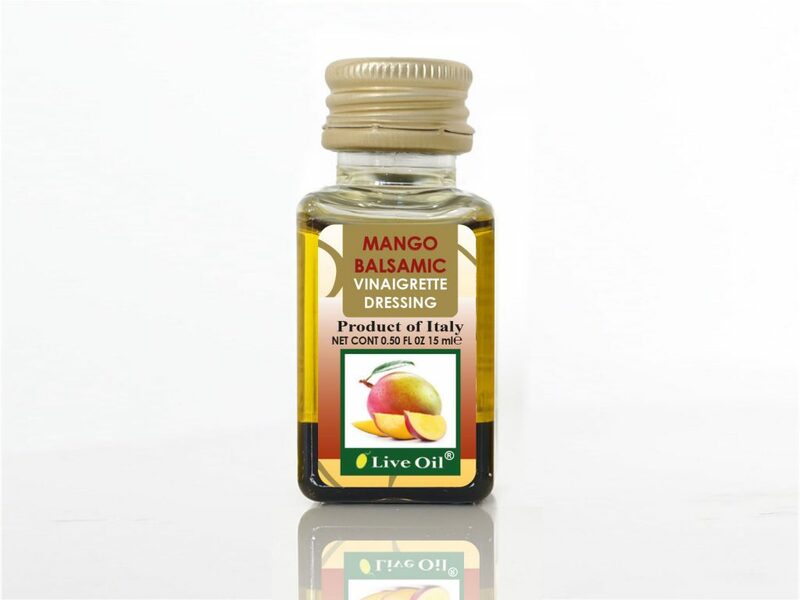 These fine oils are produced in various sizes and include 10 ml in PET bottles, 15 ml in PET bottles, 18 ml in glass bottles, 100 ml and 250 ml in glass bottles with antifilling safety system. Varieties include 100% Extra Virgin Olive Oil, various Balsamic Vinaigrette Dressings including cherry, fig, cranberry, mango, peach, strawberry, raspberry and papaya. 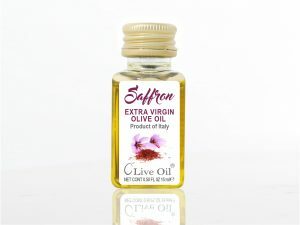 Also available a new range of Herb and Spiced Olive Oils. The plant is equipped with anti-oxidizing system (liquid nitrogen) in holding silos, so to guarantee to preserve the quality and freshness of olive oils and condiments. 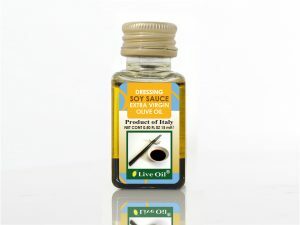 The freshly pressed extra virgin olive oil is stored in s/steel vats. 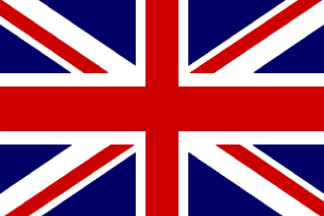 We have 4 fully automatic bottling lines for single serve bottles (PET & Glass) in our plant. 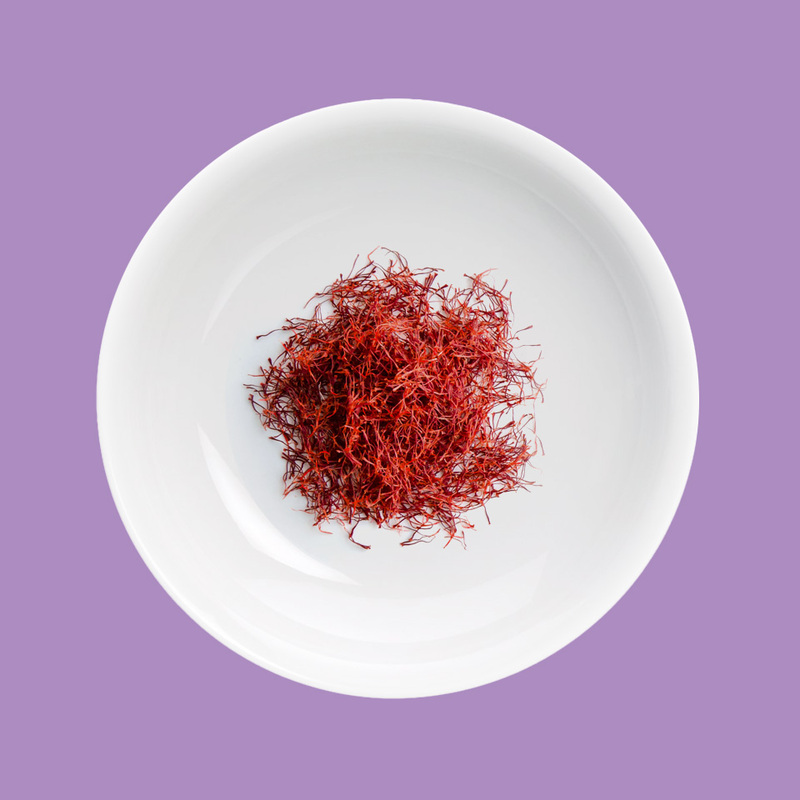 The plant is quality certified as follows: HACCP CE 852/2004, ISO 9001/2008, ISO 14001/2004, IFS (International Food Standard), FDA (US Registration). The Classic selection are packed in a square PET bottle, 15 ml, hermetically sealed with a metal security cap. 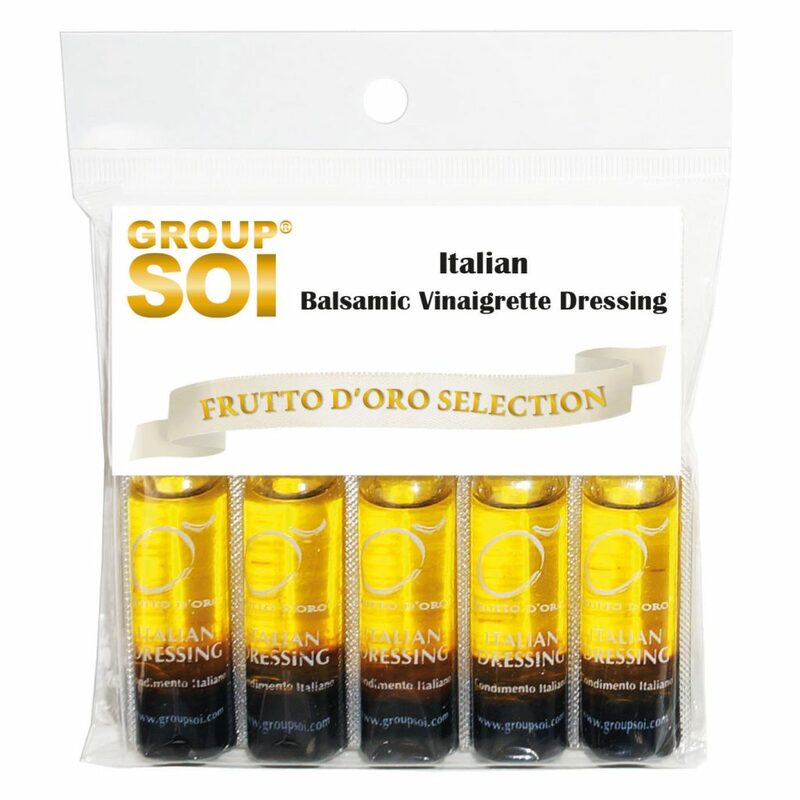 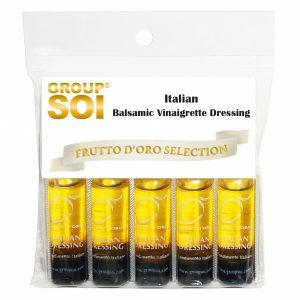 This selection is our Premium range of Extra Virgin Olive Oil and Vinaigrette Dressings. The range branded “Frutto D’Oro” is available in many varieties including: Extra Virgin Olive oil, Orange Extra Virgin Olive oil, Lemon Extra Virgin Olive oil and our most popular Balsamic Vinaigrette Dressing, using Balsamic Vinegar of Modena. 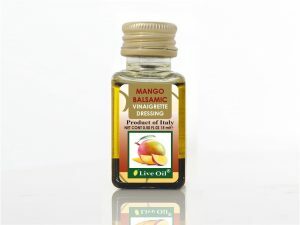 Our Chef selection branded “Frutto d’Oro” is packed in Marasca glass bottle, with capacities 100 and 250 ml. 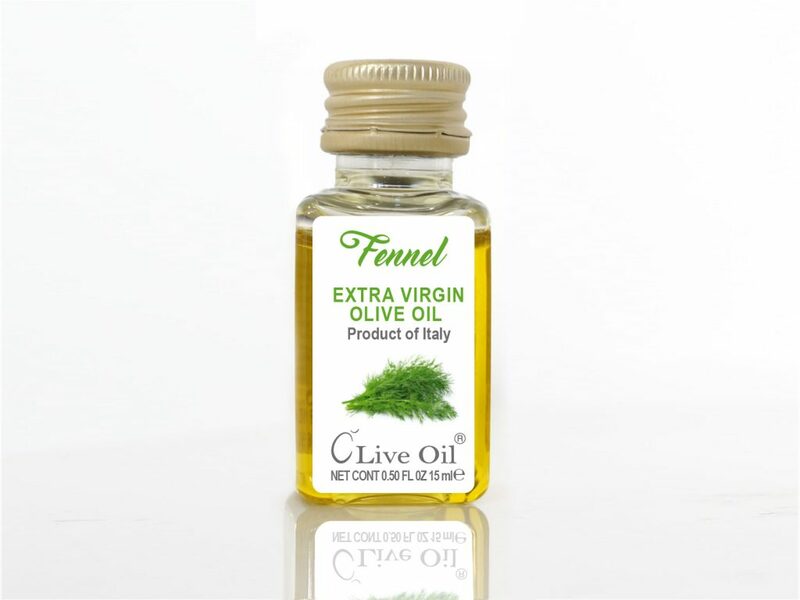 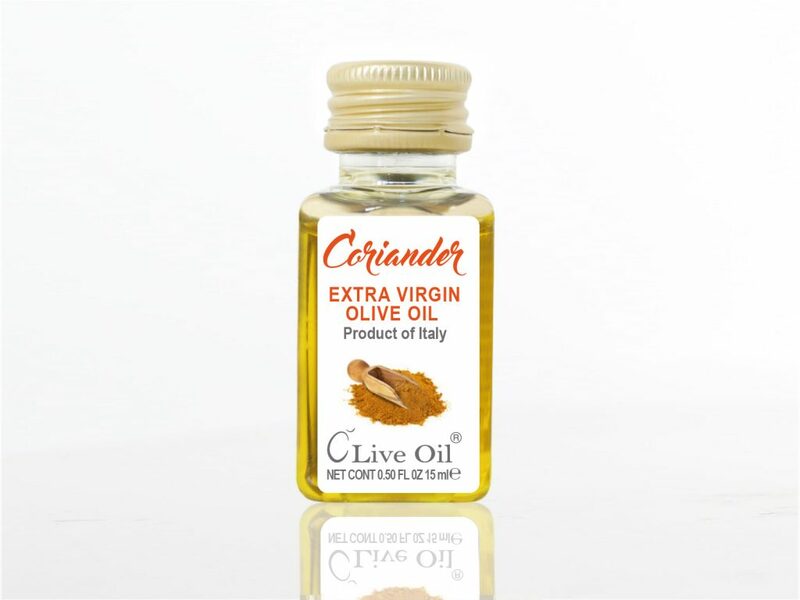 It comes in many varieties, enhance delicious dishes or add fruity notes to fresh seasonal salads, using our Ginger Extra Virgin Olive oil or Truffle oil. The New Generation of extra virgin olive oil packed in singles serve PET bottles (15 ml size) all security sealed with a golden metal cup. 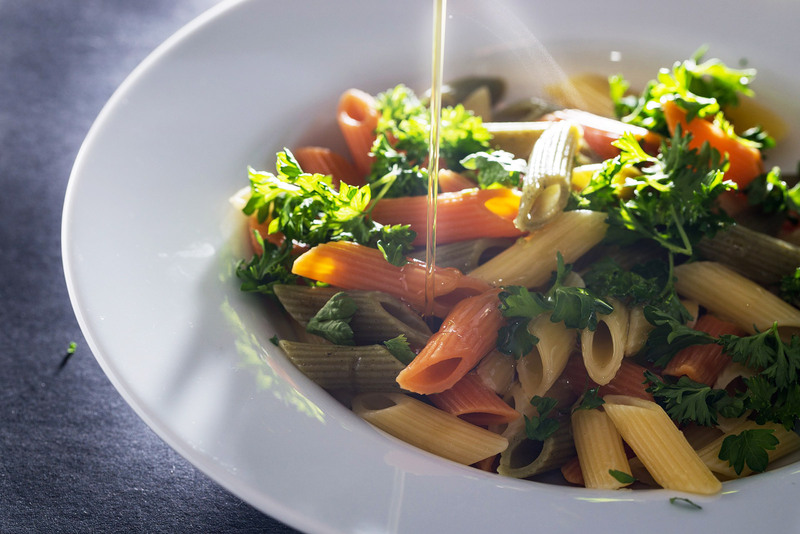 GMO free, gluten free. 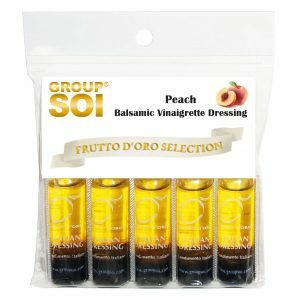 We have invented the first “Extra Virgin Olive Oil” infused with natural extract from organic herbs, spices and citrus including: Thyme, Basil, Fennel, Rosemary, Oregano, Sage, Celery, Peppermint, Coriander, Cardamom, Cumin, Black Pepper, Saffron, Bergamot Orange, Bitter Orange, Mandarin and Grapefruit. 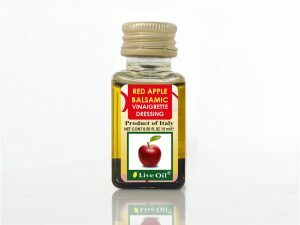 The Smart selection are packed in a square PET bottle hermetically sealed with a metal security cap. This range named the smart selection is practical and elegant at the same time. 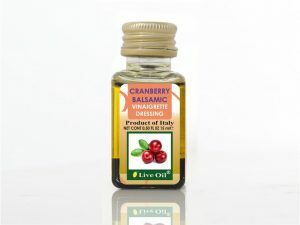 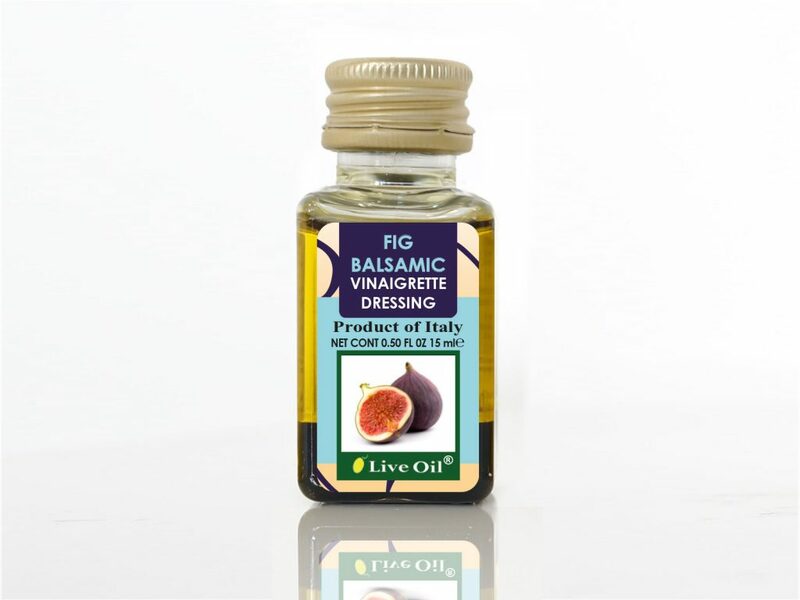 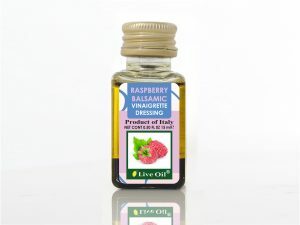 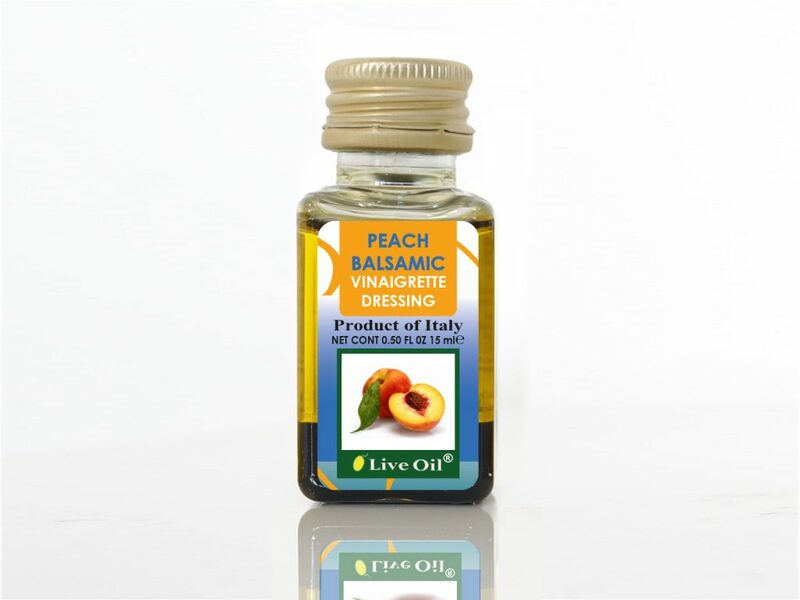 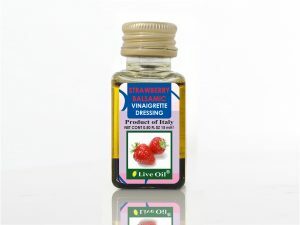 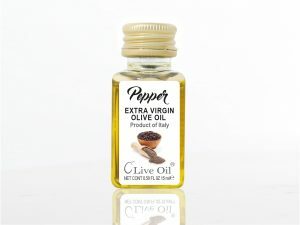 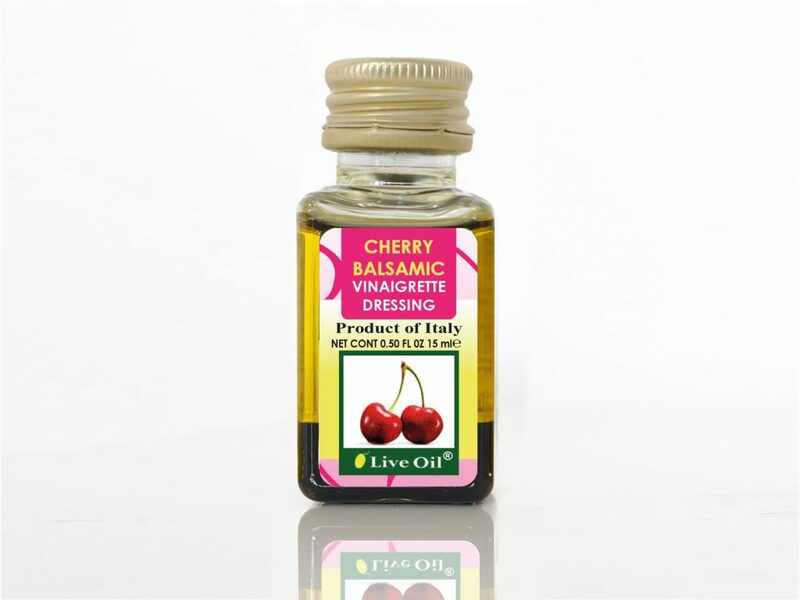 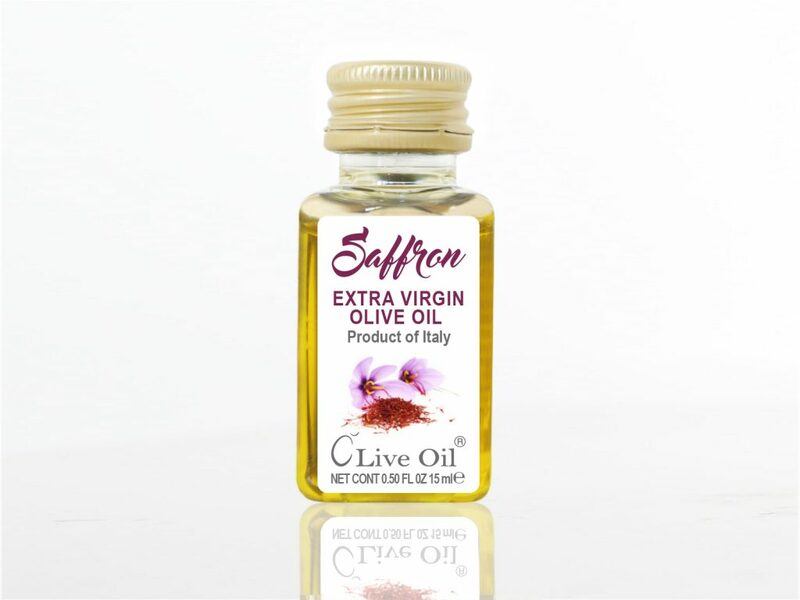 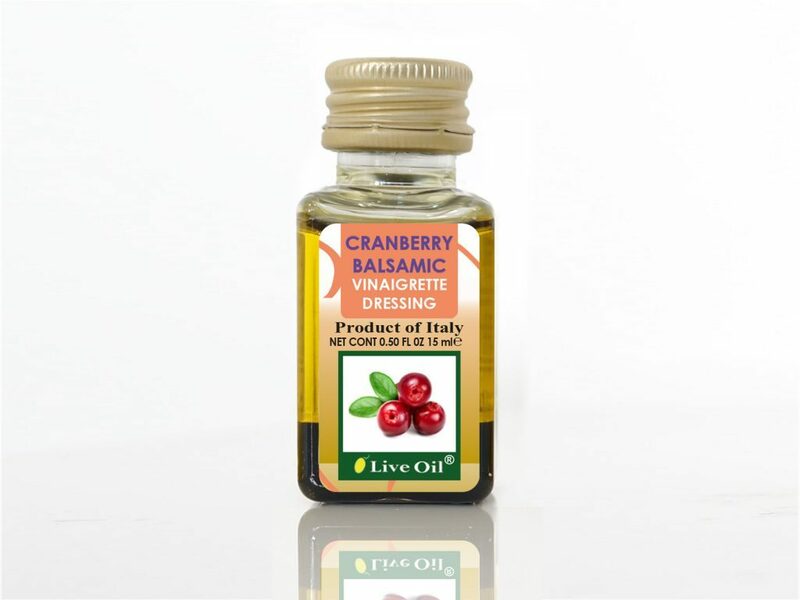 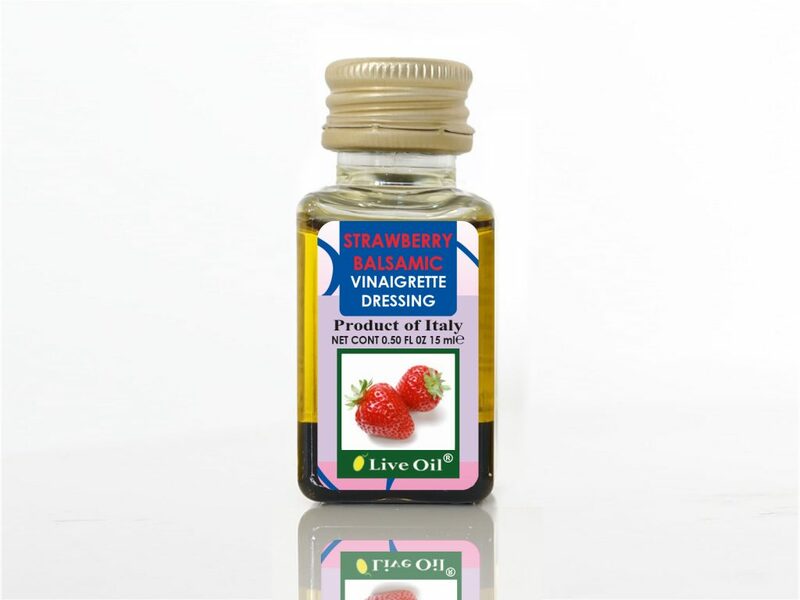 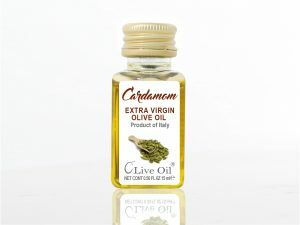 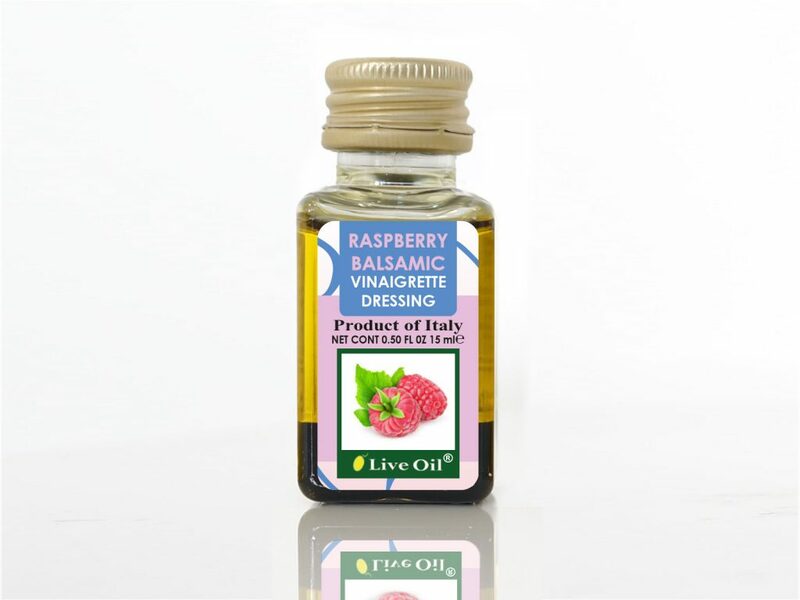 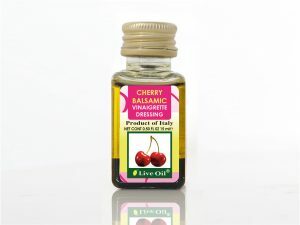 Capacity is 15ml, branded “LIVE OIL” and available in many Balsamic flavored Dressings including Cherry, Fig, Mango, Papaya, Cranberry, Raspberry, Strawberry, Peach and new Soy Sauce, Passion Fruitm, Red Apple. 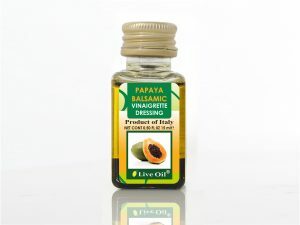 We have all chosen a healthy and wholesome way of life. O ur Extra Virgin Olive oil is made by simply pressing ripe or green olives. That did not undergo any of the industrial or chemical processes such as those used to make ‘refined’ oils such as canola, sunflower, soybean, the olive oil must have no taste defects and pass strict panel taste tests and laboratory analysis before it is labeled Extra Virgin Olive oil. It has a distinctive fresh taste, pungent, bitter, fruity, full of complexity and is high in phenolic antioxidants, the main reason why olive oil is so beneficial. You must try to understand and appreciate the difference.